Last week IDTechEx gave the opening presentation at the 2016 Korea Summit for Smart Wearable Devices, hosted by KDIA and KSA in Seoul, Korea. Wearable sensors once again dominated discussion throughout the day, with latest examples of options in MEMS, textiles and more presented at length in the conference. Additional discussions throughout the day extended to topics like glucose sensing (including enzyme-free examples), sensor fusion and beyond. By James Hayward, Technology Analyst, IDTechEx. Sensor development is driving the next generation of wearable devices, and this development is now going further than simply attaching sensors to devices that can be stuck on the body. Professor Mark Allen of the University of Pennsylvania gave a fascinating presentation about development of advanced MEMS for wearable devices. MEMS remains the dominant force in wearable sensing, but examples are now becoming broader than the increasingly commoditized, off-the-shelf and near ubiquitous IMU. IDTechEx Research’s bestselling report on the topic, “Wearable Sensors 2016-2026: Market Forecasts, Technologies, Players” finds that IMUs continue to dominate the wearable sensing space, counting for almost half of the total wearable sensor shipments in 2016. The majority of wearable sensors today are found placed on the body within devices. One step further involves inserting sensors more permanently, whether via something like a skin patch that can be worn for weeks or months at a time, or to use Professor Allen’s example from work at Georgia Tech, magnetometers to detect motion of a magnetic stud inserted as a tongue piercing. Here, the use case is to enable patients suffering significant paralysis to other areas of the body to control an electric wheelchair using the tongue. The next step is to ingest sensors - Proteus Digital Health provide perhaps the most popularized example here, but devices like pill cameras are also regularly used in the diagnostic and clinical trial settings. The next steps involve the full implantation of a sensor, either permanently or through a planned lifetime followed by degradation. Professor Allen spoke of some of their recently FDA approved work towards implantable sensors for intra cardiac pressure sensing. By fabricating a MEMS devices using ceramics, they created a biologically stable sensor that can be inserted inside the heart in high-risk patients to enable predictive diagnosis and treatment of heart disease. With the group prolifically producing new work, one area is looking at using a core-shell structure to make biodegradable sensors that can maintain structure and communication for a useful lifetime before dissolving. Sensor development is constantly improving the value proposition in many wearable and implantable products, producing state-of-the-art products for the medical space in particular. IDTechEx Research covers all of the main types of wearable sensors found in products today, as well as sensors of the future in their report “Wearable Sensors 2016-2026: Market Forecasts, Technologies, Players”. The report groups sensors in prominent categories. For each sensor, the technologies and major players are described, backed up by detailed interviews and company profiles of key bodies in each sector. The report also views the big picture, discussing the implications of sensor fusion and the relative merits of each sensor type for various applications. This extensive primary research is used to produce detailed market forecasts for each sensor type over the next decade. 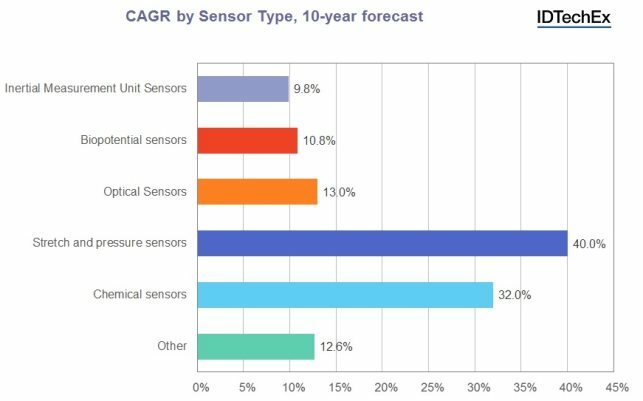 Market data is provided for the growth of each sensor type, and is used to illustrate key trends that are observable in various application sectors. Figure 1. Growth rates summary for each sensor type. Source: IDTechEx Research report "Wearable Sensors 2016-2026: Market Forecasts, Technologies, Players.